A very useful pocket guide. WELL WORTH THE MONEY, VERY INFORMATIVE FOR ALL SEASONS FLIES. THERE IS A LOT OF GEN IN THIS SMALL BOOK THAT I HAVE NEVER EVEN GIVEN THOUGHT TO IN 60 YEARS OF FLY FISHING. THIS IS A VERY WELL WRITTEN BOOK, A BARGAIN AT THE PRICE. 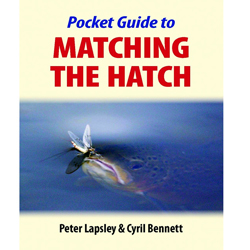 Not expensive, and packed with information about what fish will be eating at any time of the year, with suggestions for the right fly to match. Invaluable aid for the fly fisherman. This is a handy pocket sized book well thought out and easy to understand for fly fishers of any standard. Good value at this price! !